Did you know that Taylor Swift is the youngest person to single-handedly write and perform a number-one song on the Hot Country Songs chart published by Billboard magazine in the United States? Apart from that she is also the recipient of 10 Grammys, one Emmy Award, 23 Billboard Music Awards, and 12 Country Music Association Awards (enough said)! She is particularly known for infusing her personal life into her music which has received a lot of media coverage. Hence, it would be interesting to analyze her songs’ content via exploratory analysis and sentiment analysis to find out various underlying themes. Sign up for DataStock via CrawlBoard and click on the 'free' category to download the data set! Our goal is to first perform exploratory analysis and then move to text mining including sentiment analysis which involves Natural Language Processing. We’ll be using R and ggplot2 to analyse and visualize the data. Code is also included in this post, so if you download the data, you can follow along. Let’s first find out the top 10 songs with the most number of words. The code snippet given below includes the packages required in this analysis and finds out the top songs in terms of length. We can see that “End Game” (released in her latest album) is the song with maximum number of words and next in line is “Out of the Woods”. “Sad Beautiful Tragic” song which was released in 2012 as part of the album “Red” is the song with least number of words. The average word count for the tracks stands close to 375, and chart shows that maximum number of songs fall in between 345 to 400 words. Now, we’ll move to the analysis based on albums. Let’s first create a data frame with word counts based on album and year of release. Next step for us is to create a chart that will depict the length of the albums based on cumulative word count of the songs. The resulting chart shows that “Reputation” album which also the latest album has maximum number of words. The resulting chart shows that the length of the albums have increased over the years — from close to 4000 words in 2006 to more than 6700 in 2017. The resulting chart confirms that the average word count has increased over the years (from 285 in 2006 to 475 in 2017), i.e., her songs have gradually become lengthier in terms of content. We’ll conclude exploratory analysis here and move to text mining. The resulting word cloud shows that the most frequently used words are know, like, don't, you're, now, back. This confirms that her songs are predominantly about someone as you're has significant number of occurrences. Check out the graph given below to see how love is connected with story, mad, true, tragic, magic and affair. Also, both tragic and magic are connected with beautiful. Let’s now move to sentiment analysis which is a text mining technique. We’ll first find out the overall sentiment via nrc method of syuzhet package. The following code will generate the chart of positive and negative polarity along with associated emotions. The resulting chart shows that the positive and negative sentiment scores are relatively close with 1340 and 1092 value respectively. Coming to the emotions, joy, anticipation and trust emerge as the top 3. Now that we have figured out the overall sentiment scores, we should find out the top words that contribute to various emotions and positive/negative sentiment. The visualization given shows that while the word bad is predominant in emotions such as anger, disgust, sadness and fear, Surprise and trust are driven by the word good. We see that the song Black Space has a lot of anger and fear in comparison to other songs. Don’t blame me has considerable score for both positive and negative sentiment. We also see that Shake it off scores high for negative sentiment; mostly because of high frequency words such as hate and fake. Let’s now move to another sentiment analysis method, bing to create a comparative word cloud of positive and negative sentiment. 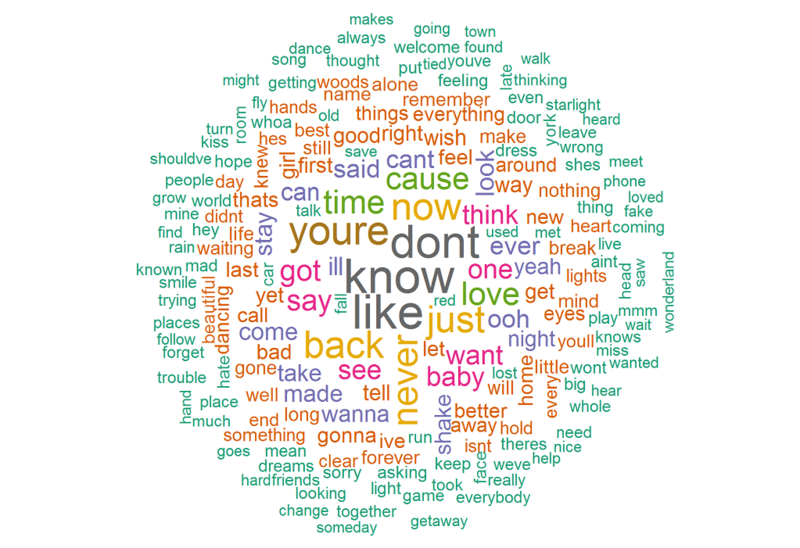 Following visualization shows that her songs have positive words such as like, love, good, right and negative words such as bad, break, shake, mad, wrong. We can see that joy has maximum share for the years 2010 and 2014. Overall, surprise, disgust and anger are the emotions with least score; however, in comparison to other years 2017 has maximum contribution for disgust. Coming to anticipation, 2010 and 2012 have higher contribution in comparison to other years. In this study we performed exploratory analysis and text mining, which includes NLP for sentiment analysis. If you’d like to perform additional analyses (e.g., lexical density of lyrics and topic modeling) or simply replicate the results for learning, download the data set for free from DataStock. Simply follow the link given below and select “free” category on DataStock.